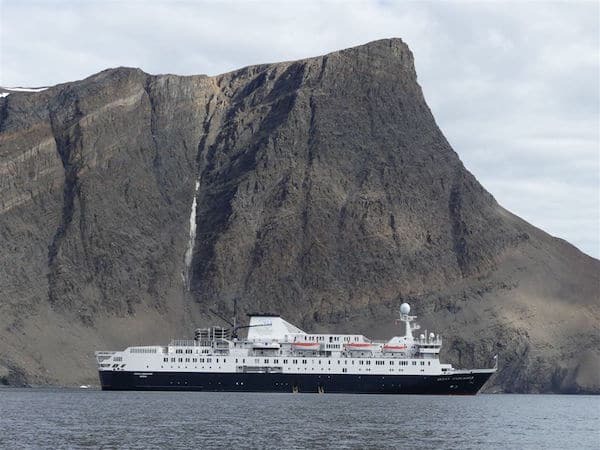 Guest contributors John and Sandra Nowlan’s expedition cruise took them to remote areas of Canada that can that can only be explored by ship. Expedition cruises, by their nature, are known for their unexpected and sometimes unplanned events. But the whales were a highlight on a fascinating Adventure Canada cruise that took us from St. John’s, up the remote and rugged east coasts of Newfoundland and Labrador to Torngat Mountains National Park and across the Davis Strait to Greenland for the flight home. St. John’s was an ideal starting point. The charming city of more than 200,000 is the oldest and most easterly in North America. After a wonderful meal (seafood, of course) at the Mallard Cottage restaurant in nearby Quidi Vidi, we joined a stream of visitors heading up Signal Hill to the iconic Cabot Tower overlooking the city where Marconi famously received the first train-Atlantic wireless signal in 1901. But the most amazing sight in St. John’s is almost hidden from view. A room in the convent next to the main Roman Catholic cathedral houses an extraordinary sculpture—The Veiled Virgin, by Italian master Giovanni Straza. Carved from a single piece of marble, it shows a young woman’s head covered in a veil that looks like a cloth add-on. But it’s not. The veil is also solid marble but carved so flawlessly it doesn’t alter the facial features or the woman’s braids. The statue arrived in St. John’s from Rome in 1856 and deserves a more high profile and secure setting. Few on our ship, the 200 passenger Ocean Endeavour, got a chance to view The Veiled Virgin, but their minds, and ours, were now on the two-week adventure ahead as we left St. John’s Harbour and headed north. First stop was at Elliston, Newfoundland, known as “The Root Cellar Capital of the World” and a wonderful location to view puffin colonies up close. But a highlight for many guests was the UNESCO World Heritage Site at L’Anse aux Meadows near the northern tip of the island. It was here that archaeologists discovered the only authenticated Norse site in North America. Parks Canada has developed an excellent interpretive centre and provides guides to explore the area and visit the reconstructed buildings as they were in 1000 AD. Actors in costumes add to the authenticity. Heading farther north, we visited one of several isolated Labrador communities that can only be reached by ship. Hopedale, population about 575, is the legislative capital of Nunatsiavut, homeland of the Labrador Inuit. In 1782, Moravian missionaries arrived from Germany hoping to convert the Inuit to Christianity. The Hopedale Mission still stands as the oldest wood-frame building in Atlantic Canada. The Moravian influence is still strong with many adherents to this old Protestant denomination that emphasizes personal piety, ecumenism and music. We saw many fading photos of local Inuit brass bands. Hopedale is still an active community (although with a greatly diminished population) so it was very sad to visit Hebron the next day, one of the Labrador Moravian communities whose residents were forced to relocate to larger towns in the late 1950s. Community members were not consulted and resettlement proved to be very difficult. In 2005, the Newfoundland and Labrador premier apologized to relatives and a plaque with the apology was unveiled at the site. The Mission House and several abandoned houses still stand in Hebron, lonely monuments to a troubling time in Northern Labrador. Labrador has a sparse population but spectacular scenery. Few landscapes on earth are as dramatic as those in Torngat Mountains National Park at the northeast corner of Labrador. Fjords cut deep into the mountains flanked by peaks rising more than 5,000 feet. Our guides said that more people climb Mount Everest each year than visit this remote seaside National Park. It’s a breathtaking reminder of the spectacular nature of Canadian geography. Our expedition aboard the Ocean Endeavour ended in Greenland after a day at sea crossing the unusually calm Davis Strait. Adventure Canada is known for its staff of professional naturalists and we had a chance to hear several richly illustrated lectures in Arctic history, photography, archaeology and biology. All superb. Before we sailed up the longest fjord in the world to the former US Air Force base at Kangerlussuak and our flight home, we visited bustling Nuuk, Greenland, the northernmost capital in the world and the remote fishing village of Kangaamiut, population 350, with colorfully painted homes perched on solid bedrock. The small town welcomed us with drumming, an excellent choir and demonstrations of seal skinning, a key part of its way of life. Adventure Canada has now been in business for almost 30 years with a mandate to bring visitors to the Arctic who will become, in the words of cruise leader Matthew James Swan, “Ambassadors for the North.” His sister, Cedar Swan, the company’s CEO, told us that new partnerships with the World Wildlife Fund and with Parks Canada will enhance its goal to get more people to visit national parks and other areas of the North that are not easily accessible. Chris Harvey-Clark and Sarah Gutowsky, both biologists at Dalhousie University in Halifax and lecturers aboard the ship, are huge fans of adventure cruising in the North. Chris was impressed with the captain’s ability to get the ship into hard to access areas. He brought along his 76-year old mother and commented that, for older visitors with some mobility issues, this is the only way they’re going to get deep into the Arctic wilderness. Sarah told us she’s addicted to Labrador, particularly its landscape and people. Disclosure: The Nowlans cruise on the Ocean Endeavor was hosted by Adventure Canada. I had a wonderful vacation in the Maritime (and Goose Bay, Labrador) Provinces of Canada. What a unique, fascinating place. I took some great photos. Also love the carving of the Veiled Virgin in the cathedral, by the renowned Italian master G. Straza. The people in that region are so friendly and just so nice. I really enjoyed reading your article and seeing your great photos. How lucky that you had the opportunity to visit this beautiful region!